At first glance the Xelibri 7 looks like conventional, but stylish phone. But look more closely and the Xelibri's true nature becomes clear.. it's a giant clip. This highly unusual design allows the Xelibri 7 to clipped onto a belt, pocket or other item of clothing, allowing you to show off your phone easily! The Xelibri range is designed to be a fashion statement, and they're all highly unusual and interesting phones that are different from typical high street fare. 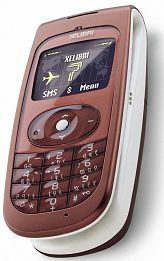 The Xelibri 7 is created by Siemens, guaranteeing a quality, fun and fully functional phone. The Xelibri 7 is a dual band GSM 900/1800 phone measuring 104x46x26 mm and it weighs a tiny 83 grams. Talktime is up to three hours with up to 12 days standby. The display is a 4000 colour 101x81 pixel panel, and the Xelibri 7 supports polyphonic ringtones, predictive text, vibrating alert, SIM exchange on the fly, two games and many other features. The Xelibri 7 is available as a SIM Free handset in Midnight Blue and Copper Polished colours for around �180. Also available on Vodafone contract.